Now in full color, this engaging, conversational text helps students understand the common professional standards that all healthcare workers need to provide excellent care and service. 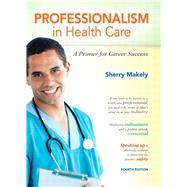 PROFESSIONALISM IN HEALTHCARE: A PRIMER FOR CAREER SUCCESS, 4/e brings together complete coverage of these and other crucial ;soft skills ;: work ethic, character, relationships, teamwork, communication and etiquette, honesty, cultural competence, personal image, personal health and wellness, and more. Revised and improved throughout, this edition gives students a clearer understanding of where they fit in the changing healthcare system, why patient satisfaction is more important than ever, how to behave with the professionalism that both employers and patients demand, and how to move forward in their own careers more rapidly. This edition also contains many new pedagogical features, including an extensive new website.